Architecture is a sector that is being increasingly influenced by 3D printing with numerous structures created using the technology; it offers greater liberty in terms of design and complexity of form. Additive manufacturing may also become a means for designing structures that are more sustainable and environmentally friendly. These benefits have been exploited by the company Emerging Objects which recently unveiled The Cabin of Curiosities, produced from 3D printed tiles that blend perfectly with nature. Emerging Objects is a US company specialising in 3D printing and innovative solutions for buildings, interior design and the environment. It has notably begun producing 3D printed objects from recycled tyres. 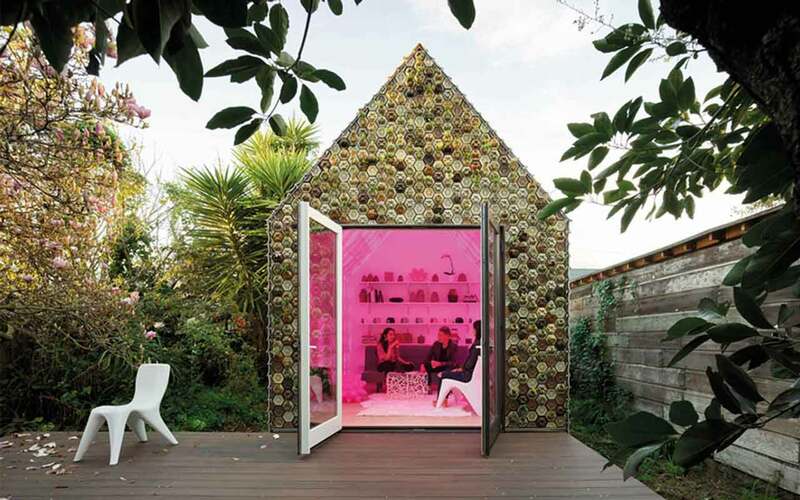 This time it has turned to garden equipment with a new cabin constructed from 3D printed tiles. 4,500 3D printed tiles cover the cabin, which is both watertight and habitable. The material was produced from cement, sawdust, salt and even grape skins. A fine example of upcycling! As for the front, it’s a real living wall with small tiles designed to contain all sorts of plants. The roof and adjoining walls are of different design, resembling stitched panels. According to Emerging Objects no two tiles are identical, underlining the originality of the project and the opportunities offered by 3D printing in terms of personalisation. Inside, the walls are 3D printed from translucid bioplastic and LED lights of changing colours. Many decorative objects have also been 3D printed by the US company. Ronald Rael, co-founder of Emerging Objects, explains: “It is not only an experiment into the longevity of the materials forming the structure, but also a study in aesthetics. We see the future as elegant and beautiful.” It is an initiative that reminds us of the 3D printed facade by DUS Architects, which also called on the re-utilisation of materials. One thing is certain: The Cabin of Curiosities is a fine demonstration of what 3D printing is able to offer today’s architects! Do you have a project you wish to pursue using 3D printing? Don’t hesitate to contact us; we can help you achieve your goals!